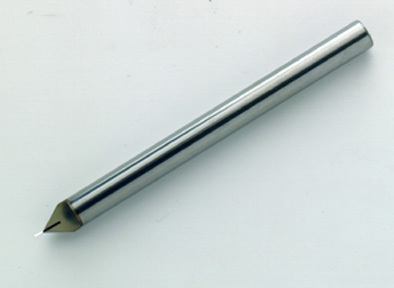 Technodiamant supplies extremely small, precise single crystal diamond endmills and drills. Milling tools with flat tip and drilling tools with an extra facet at the tip are offered in sizes as small as 0.3mm diameter. 0.3mm cutting diameter to 0.7mm cutting diameter are available as “standard”. We can hold cutting diameter to +/- .010mm. Cutting edge can be parallel to centerline of shank, or offset up to 7 degrees. Parallelism held to within .02mm. They are provided in whatever size diameter holder you would like (i.e. 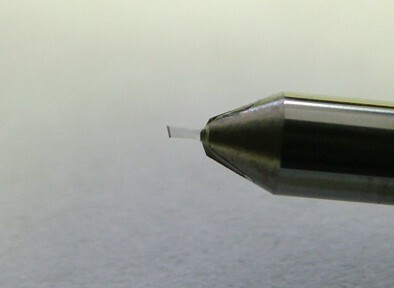 1/8″, 1/4″, 2.5mm, 3.0mm). These tools can be used for machining a wide range of polymers; it is extremely important to have a stable milling machine, preferably with 6 or 8 jaw collet. The higher the RPM the better; some manufacturers use 80,000 RPM. If the system is stable, these drills can produce thousands of holes before needing to be replaced. If it is possible to freeze the plastic before machining, the resulting surface finish is beautiful. Call us and we will send you copies of drawings depicting the different geometries available.